My poor black Leviathan, so unhip. I’ve been reviewing Razer accessories and hardware for ages, and aside from the odd license tie-in and those rainbow headsets, they’ve mostly had one thing in common—they’ve been black. Well now we’ve got the Mercury line, so bright and white they look like the restless spirits of real Razer products. 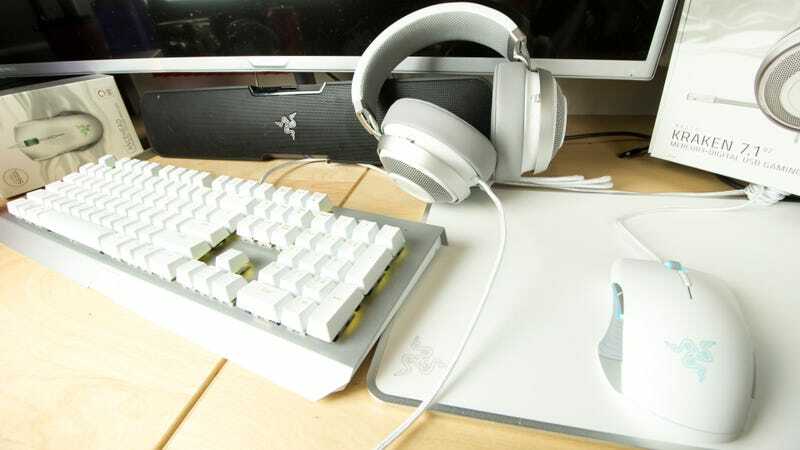 Razer’s actually got two new color schemes going on, Mercury (white) and Gunmetal (gray), but gray is really just light black, babysteps compared to the jarring contrast between Razer’s jet black lineup and these ivory beauties. First off we have the Invicta “gaming surface.” I put gaming surface in quotes because it’s generally just a fancy term for mouse pad, but in this case it might be appropriate. For one, this has a case. The Invicta is a dual-sided gaming surface (it’s growing on me). One side is smooth for speed. The other is rough, for control. It costs $60 and weighs around 1.5 pounds, not counting the case. The weight is because the Invicta pad comes with an aluminum base plate. That’s one serious mouse pad. And here’s a serious mouse for it. The Lancehead Tournament Edition is a mouse with a 16,000 DPI 5G optical sensor, tracking at 450 inches per second. As a man who generally gets by with a trackball, that’s ridiculous. The $80 Lancehead is completely symmetrical, with side buttons on the left and right so anyone can use it, regardless of dominant hand. Plug it in and place it on top of the Invicta and it looks like a racing pod from some utopian future. The Kraken 7.1 v2 is Razer’s middle-of-the-road headset, priced at $99.99 (the $200 Razer Tiamat 7.1 V2 is their latest top-of-the-line wired set). It’s a great set of cans with a pretty good retractable mic. The switch to white isn’t as dramatic for this one, mainly because I never see it once it’s on my head. It’s still very pretty. The $150 Blackwidow X, on the other hand, barely looks like a Razer product anymore. Rather than go straight-up white everything, Razer made the exposed metal plate silver, giving the board a lovely contrast. The Razer logo on the front is barely visible when the unit’s LEDs are off. There is something otherworldly about a set of shine-through white keycaps with soft RGB lighting piping through. It’s dreamy. Razer’s even gone as far as running a batch of their custom switches (this one has the clicky greens) with a pale gray housing as opposed to the normal black. The company’s made a real commitment here. The whole set comes together nicely. Razer is known for creating aggressive-looking gaming hardware with bold (some would say obnoxious) branding. The Mercury line softens those rough edges considerably. Seriously looks like someone’s Razer desktop died and is haunting me.